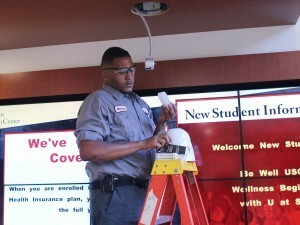 USC is committed to providing a safe and healthy work environment for all employees. You play a special role in making sure this commitment is carried out, because you best know your workplace, the employees, and the demands they face. Therefore, you play a critical role in ensuring health and safety in your area. Ultimately, you are responsible for the health and safety of your employees. You are also a key link to campus resources which have been set up to handle workplace health and safety issues. While you are not expected to be an expert on every resource, you should be aware of all of them and be able to point your employees to those that will best serve their needs. In addition, you are a role model and motivator for employees in your department. The importance you place on workplace health and safety is conveyed to them by your actions as well as your words.